The independent games industry has been booming over the last 10 or so years. Yet its more modest origins go back to the early 1990s, when it was strictly PC oriented and distributed only via shareware. With the evolution of gaming, however, came higher user expectations, and combined with the advent of fully 3D graphics it became harder for smaller games development teams to keep up. To this day it still remains an incredibly lengthy and difficult task to produce a video game within a small team, although advancements in digital distribution methods, cheaper licensing fees for pre-made game engines, a much wider range of platforms to develop for and crowd-funding have certainly made it easier. A growing number of influential, award-winning games are being produced and distributed by small teams all around the world as production becomes less costly and time-consuming. One notable example, Supergiant Games’ 2011 action role-playing game Bastion, inspired Trent Kusters to form a small team of his own to try and achieve similar success. At the time he was a lead designer at Torus Games, one of Australia’s oldest and most consistently stable major game development studios. He worked on already-licensed titles that offered little to no creative input, and wanted to make an original game of his own design from the ground up. Along with Torus co-workers Ty Carey, Blake Mizzi and Jacek Tuschewski, they formed the Melbourne-based independent game company League of Geeks and began brainstorming. 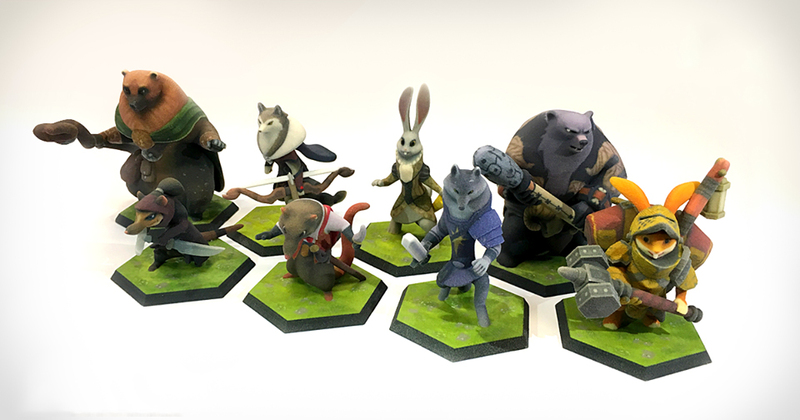 Production on what would later become known as Armello began in the form of a board game, which they developed on paper and refined at their weekly meetings. Their original plan was to have a digital multiplayer board game ready to ship for the iPad in six weeks. This timeline ballooned as the game became increasingly complex in design. It took approximately a year of play-testing before they were even ready to begin working on the digital version of the game. Only, none of the four founders were programmers, and they had no money to pay anyone to do the work that they couldn’t. With this in mind, they developed a points system whereby freelance programmers and artists could contribute to the workload in exchange for a share of the profits once the game was released. Despite its fair share of halts on production due to unforeseen circumstances over the following years, League of Geeks carried on with their vision and utilised a successful crowd-funding campaign that raised over $300,000 to help them produce the game full-time. This led to their porting the game from the tablet to PC, and it was featured on online games distributor Steam’s Early Access release platform in January 2015. The completed version of the game was released for mobile, tablet, PC, OS X, Linux and PS4 on 1 September last year to positive reviews. League of Geeks’ office is located at the Arcade, a not-for-profit, collaborative workspace in Southbank created specifically for game developers and creative companies. They share the building with a multitude of other independent game companies as members of the Game Developers’ Association of Australia. The GDAA advocates on the behalf of its members to industry stakeholders including governments, publishers and industry advisors to promote, grow and attract investment in the Australian games development industry. The independent games industry can be an extremely competitive place. Luckily, with a cooperative approach, Melbourne’s games designers are ready to take on the next level. For information on upcoming projects by League of Geeks check out their website at http://www.leagueofgeeks.com/. For more about the collaborative design space at the Arcade go to http://www.thearcade.melbourne/.